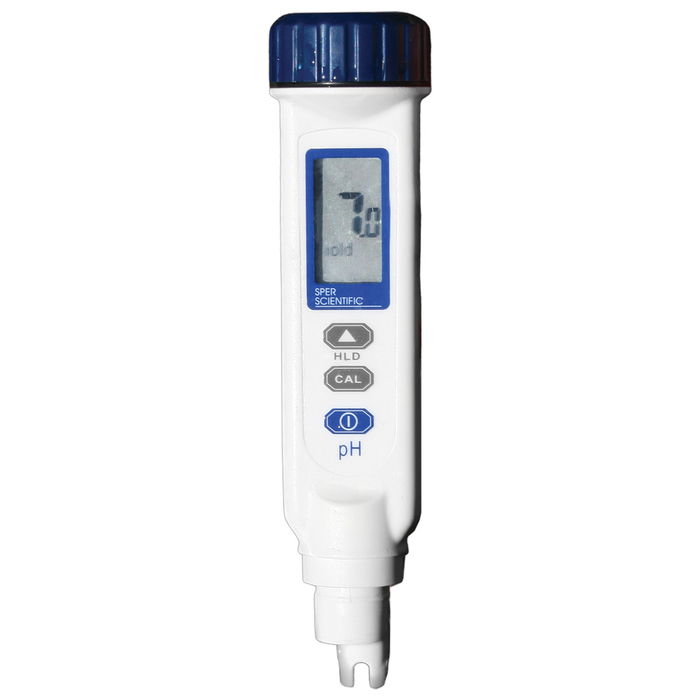 The Sper Scientific ATC pH Pen has highly stable and accurate readings with a large LCD display. Designed for simple one-hand operation. Automatically calibrates to pH 4, 7, 10 buffers and can be adjusted to recognize non-standard buffers as well. Features hold function, and auto power off with low battery indicator. All Sper Scientific pH pens are IP65 water proof, and will float if accidentally dropped into the water. The Sper Scientific Large Display ATC pH Pen comes with 4 button-cell batteries and a built-in electrode kept moist with a protective cap. Dim: 6 ½ x 1 ½ x 1 ½” (165 x 38 x 38 mm). Weight: 2 ½ oz (68 g). Models 850051 and 850052 also feature a wider pH range, ATC (Automatic Temperature Compensation) and display temperature in ºC or ºF. Model 850052 also features a higher resolution and accuracy.